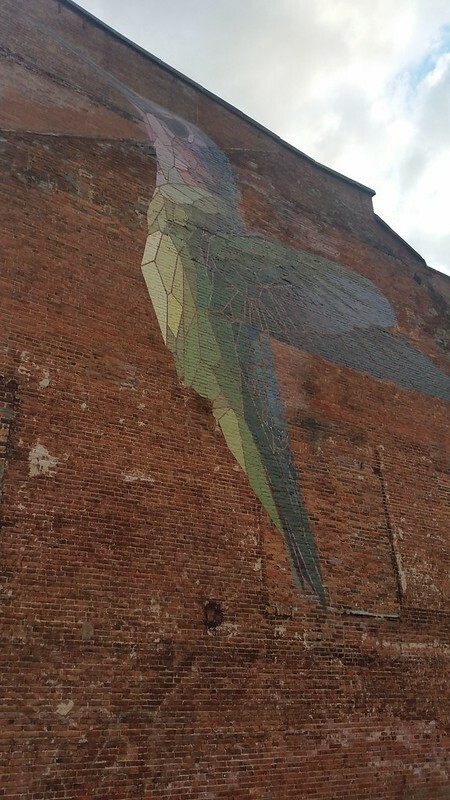 A humming bird painted some 30-feet tall along the side of a brick building. I like city art that surprises, inspires, and causes one to double-take and that's what this hummingbird did for me. First, it's size grabs your attention when thinking about the small little bird writ large across this building. The mixture of colors on the bird was also cool in that the artist too some liberties with the colors but not so much that it felt completely different. The artist also captured what I would consider to be the essential pose for hummingbirds that make us all so fascinated by them--the vertical hover post. Finally, I love that this stands on a brick wall without other coloring or background. I think more background would reduce the power of the bird's presence.